Choosing a high back leather chair can assure you of both comfort and style. Whether forthe office, media room, board room or bar there are high backs that fit the design of the room. The high back padded leather cushions allow for a plush feel as well as support of the lumbar region in your back. This allows you to sit comfortably for a longer time whether you are working or just enjoying good friends. 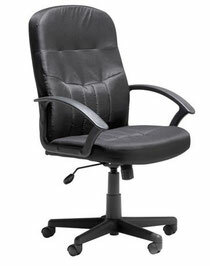 There are several things to consider when choosing your high back leather chair. First, is does it come fully assembled or do you need to put it together. "Easy assembly" may be true, but not if you don't want to do that work! Next, make sure that the weight class of the chair is suitable for your needs. Some have a maximum weight of 225 pounds while others have a 350 pound limit as standard. If you are taller or shorter than average, make sure the height of the seat is adjustable as well. Adjustable depth of the seat back is another option you may find will enhance your comfort. You may also consider a waterfall type seat. This is a seat that slopes downward which reduces pressure in the legs for improved circulation. To reduce shoulder stress, choose a chair that comes with padded arm rests. Tilt control and tilt control locks make sure the chair stays at an angle that suits you best. Leather for the high back and seat comes in many colors to suit your decor including burgundy, cafe brown, spruce green, navy blue and off white -- but some high back chairs are offered only in black. It is a good idea to buy all the chairs you need at the same time as there can be differences in future dye lots of the colored leather. The leather can be smooth and buffed to a high shine -- or with a heavy grain and texture. You can also find a few that come with sports names embedded into the leather, such as Nascar. Leather chairs come with either wooden or metal accents. If you choose wood, you can find interesting woods such as burgundy cherry and mahogany. Or you can opt for easy care and choose metal. Some high back chairs can come with replaceable covers for the leather, too.